Glénat Editions SA is a French publisher with its head office in Grenoble. Their products include comic albums and manga in France, Benelux, and in the past Spain; it was founded by Jacques Glénat. The Benelux subsidiary, Glénat Benelux N.V., is located in Brussels, Belgium. The Switzerland subsidiary, Glénat Editions (Suisse) SA, has its headquarters in Nyon. The Spanish subsidiary had its head office in Barcelona. Jacques Glénat started his comics fanzine Schtroumpf (the French, original, title of The Smurfs) in 1969, when he was still a student. In 1972, only twenty years old, he established his own publishing house, Glénat. The first two books were by Claude Serre and by Claire Bretécher. Two years later, he already received the award for best publisher at the Angoulême International Comics Festival. To support the rapid growth, the company opened warehouses in Orly near Paris, and a flagship store in Paris. A new comics magazine, Circus, first appeared in 1975 and existed until 1989. But the next few years saw Glénat move more away from the traditional juvenile Franco-Belgian comics and more towards the graphic novel, with an emphasis on their successful historical series by François Bourgeon and André Juillard. A second magazine, Vécu, dedicated to historical comics, was created in 1985 and survived until 2004. From 1980 on, Glénat also published non-fiction books related to mountain climbing and to the sea. They also bought the publisher Vents d'Ouest and from 1991 on started publishing manga. But the biggest success of all came with Titeuf by Zep, which soon was one of the bestselling French comic series, with its own magazine Tchô and animated series. As of 2009, the company gets 50% of its turnover from comics, 20% from manga, and 15% from books, with the last 15% divided over smaller products. The book division has a catalogue of over 4,000 titles, publishing some 400 new books and 12 million volumes a year. Bestselling series include Titeuf, with 16 million copies, and Dragonball, with 17 million copies. It is the second largest comics publishing group in France, behind Média-Participations, with some 20% of the market. The company has two international subsidiaries, Glénat Benelux and Glénat Suisse (Switzerland). The company is also very active in Canada and collaborates with other publishers in other countries. Apart from translating and distributing the original Glénat productions, these regional companies also produce their own content and specializations. Glénat Benelux has 13% of the market of Belgian comic shops. 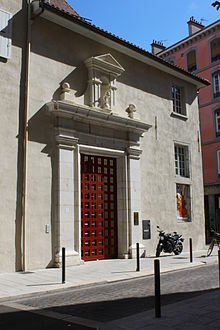 The company head office is in central Grenoble, in the former Convent of St. Cecilia, a 17th-century building which previously hosted a theater. Jacques Glénat had the building restored so it could become the headquarters of the company. The building's restoration took five years to complete. 100 employees work in the building. The building's archives, library, and private collection are open to the public. ^ "Contacten Archived 2011-08-14 at the Wayback Machine." Glénat Benelux. Retrieved on 1 May 2011. "Glénat Benelux N.V. Sint Lambertusstraat 131 B - 1200 Brussel"
^ "glenat-logo-site-600.jpg Archived 2006-06-21 at the Wayback Machine." Glénat Suisse. Retrieved on 3 May 2011. "Rte de Divonne 46 1260 NYON"
^ "Oficina." Glénat España. Retrieved on 1 May 2011. "Dirección c/ Sancho de Ávila, 83-89 4ª planta 08018 Barcelona "
^ "Glénat cambia de accionariado." Glénat España. Retrieved on 6 Apr 2013. "Editions Glénat, editorial francesa con más de 40 años de existencia, ha cedido el 100% del capital de Glénat España a Joan Navarro y Félix Sabaté, los dos máximos responsables de la filial." ^ a b "Jacques Glénat, 40 ans de passion pour la BD." Ouest-France Multimédia. Sunday 18 October 2009. Retrieved on 31 December 2011. "Toutes ces collections vont trouver leur place dans une grande bibliothèque - ouverte au public - que nous installons dans notre nouveau siège social, au coeur de Grenoble. Il s'agit d'un ancien couvent du XVIIe siècle dont la restauration a duré cinq ans. Une centaine de salariés y travaillent." ^ a b Dary, Thibaut. "Quarante ans dans ses bulles." Le Figaro. 3 October 2009. Updated 2 October 2009. Retrieved on December 31, 2011. "C'est d'ailleurs là que vient d'être inauguré le nouveau siège du groupe. Jacques Glénat a racheté et fait restaurer avec le plus grand soin le couvent Sainte- Cécile, datant du XVIIe siècle. Archives, bibliothèque, collection privée ouverte au public[...]"
This page was last edited on 11 June 2018, at 17:51 (UTC).